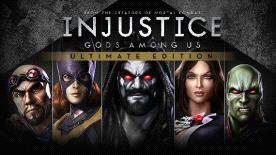 INJUSTICE: GODS AMONG US ULTIMATE EDITION software © 2013 Warner Bros. Entertainment Inc. Remastered by High Voltage Software, Inc.. Original game developed by NetherRealm Studios. All other trademarks and copyrights are the property of their respective owners.